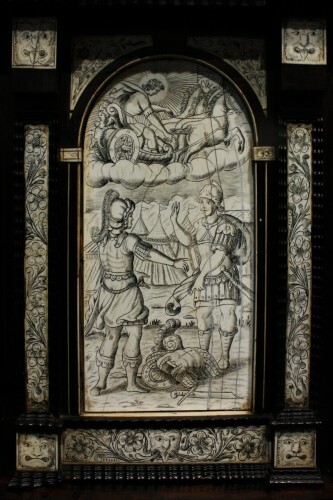 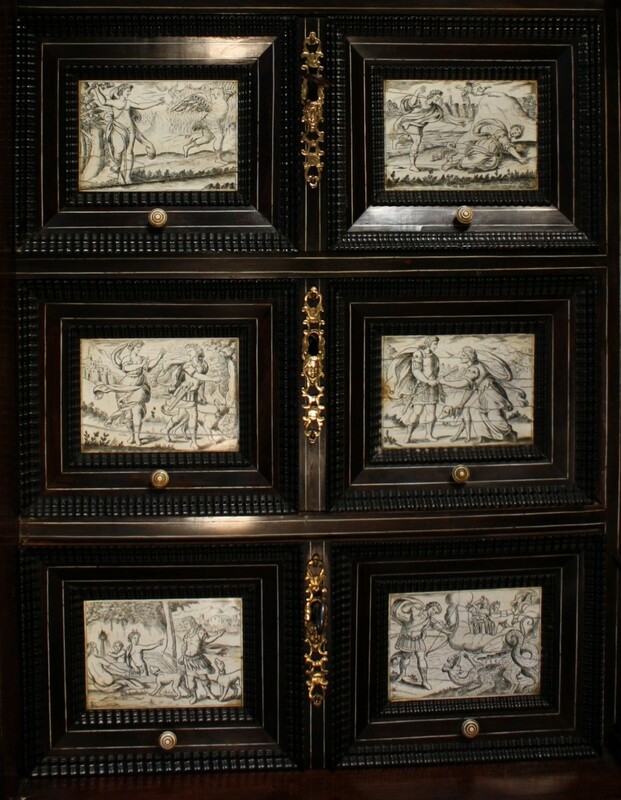 This highly important and rare cabinet adorned with engraved ivory plates is attributed to cabinet maker Iacobo Fiammengo, (known in Napoli between 1580 and 1630) and to ivory engraver Giovanni Battista de Curtis, after engravings by Antonio Tempesta (1555-1630) depicting Ovid's Metamorphoses. 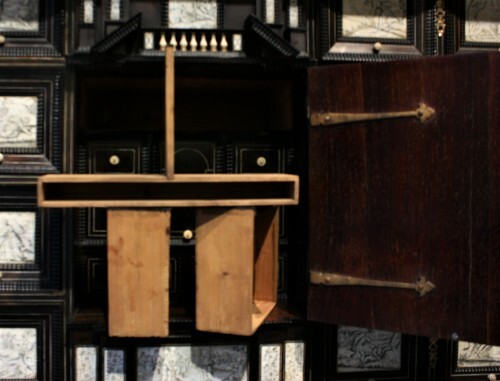 Rectangular in shape, the cabinet opens with ten drawers and a central door. 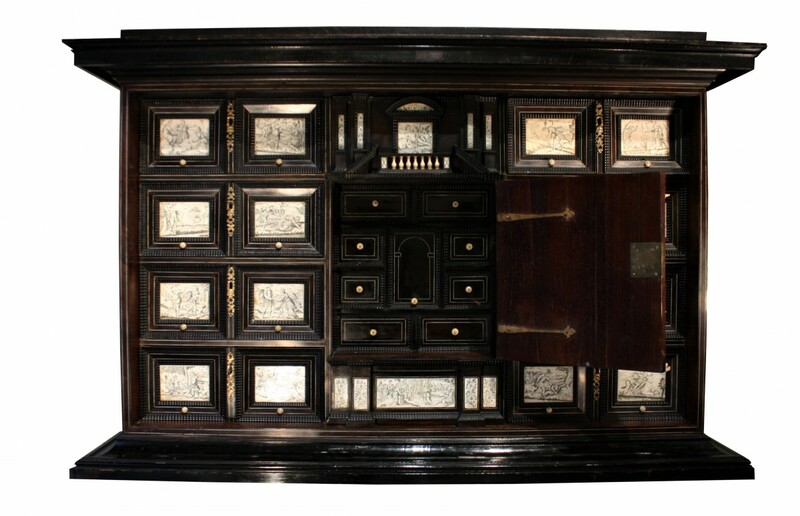 Each drawer is adorned with two ivory pads engraved and enhanced in ink from mythological scenes from Ovid's Metamorphoses. Each wafer is placed in a double frame of wavy mouldings in ebony, rosewood veneer and inlay of ivory fillets. 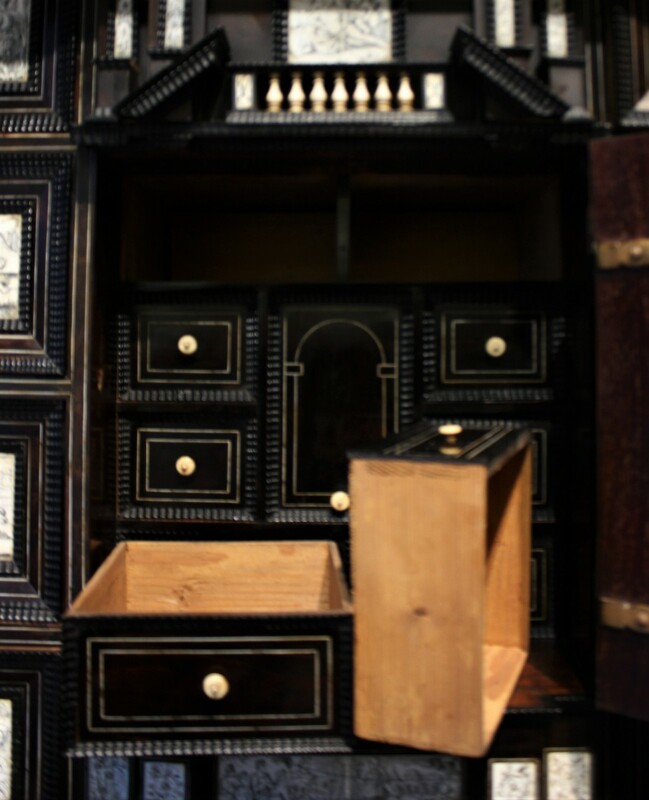 The drawers are equipped with ivory draw buttons and a golden Bronze lock entry. Les tiroirs se trouvant au-dessus et en-dessous de la porte centrale forme avec celle-ci un ensemble évoquant un portique d’un temple antique appartenant au répertoire de l’architecture classique. 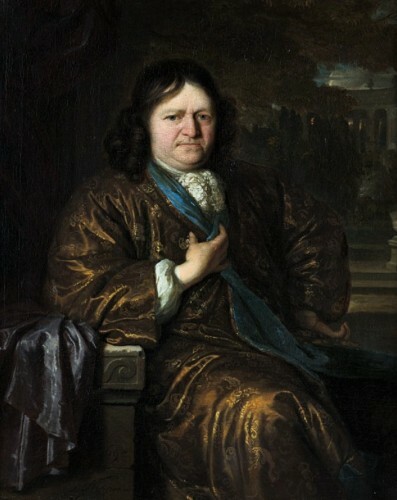 Il se compose d’une corniche brisée accueillant une balustrade en ivoire tourné en son milieu. 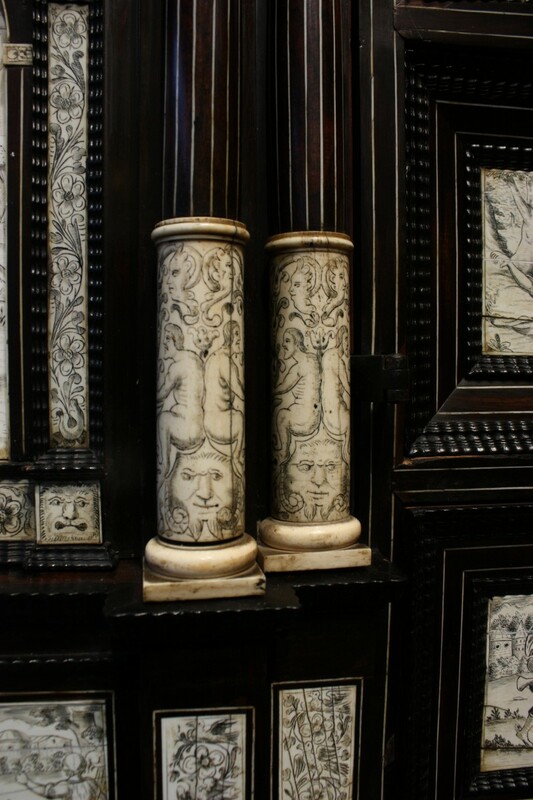 Deux colonnes de chaque côté au chapiteaux ioniques en ivoire mouluré soutiennent les entablements ornés de moulures ondées en ébène encadrant les plaquettes d’ivoire gravées de mascarons et fleurs. 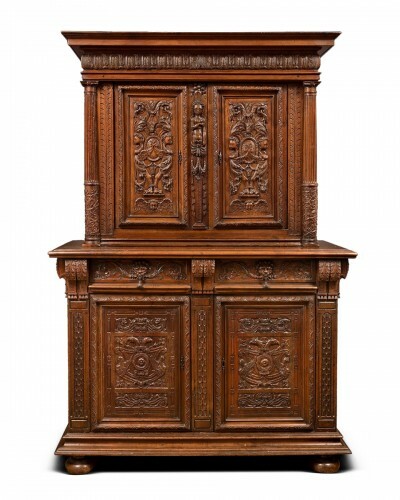 Les colonnes à fut incrusté de filets d’ivoire dans la partie supérieure, sont ornées de placage d’ivoire gravé. 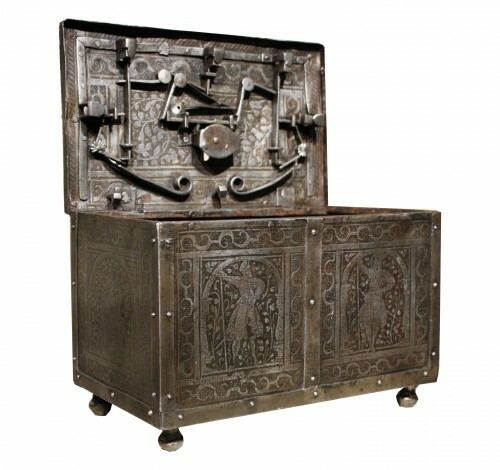 A l’intérieur neuf tiroirs dont deux supérieurs qui cachent un compartiment secret, tous en placage de palissandre et encadrement de filets d’ivoire et de moulures ondées ; munis de boutons de tirage en ivoire. 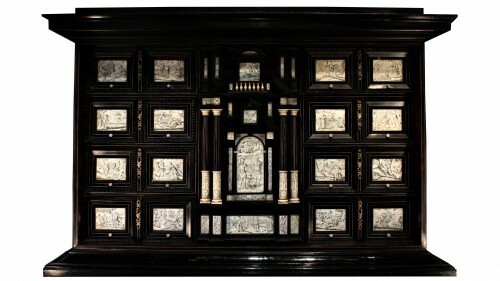 SImilar cabinets: Museum für Kunst und Gewerbe, Hamburg, signed De Curtis, Victoria and Albert Museum, London, Philadelphia Museum of Art, Los Angeles, County Museum of Art, Musée Benoît-De-Puydt de Bailleul, Musée de Saint Martin de Naples. 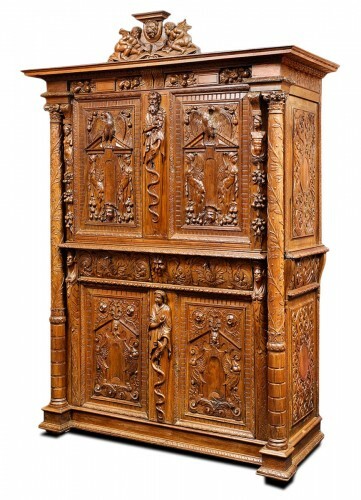 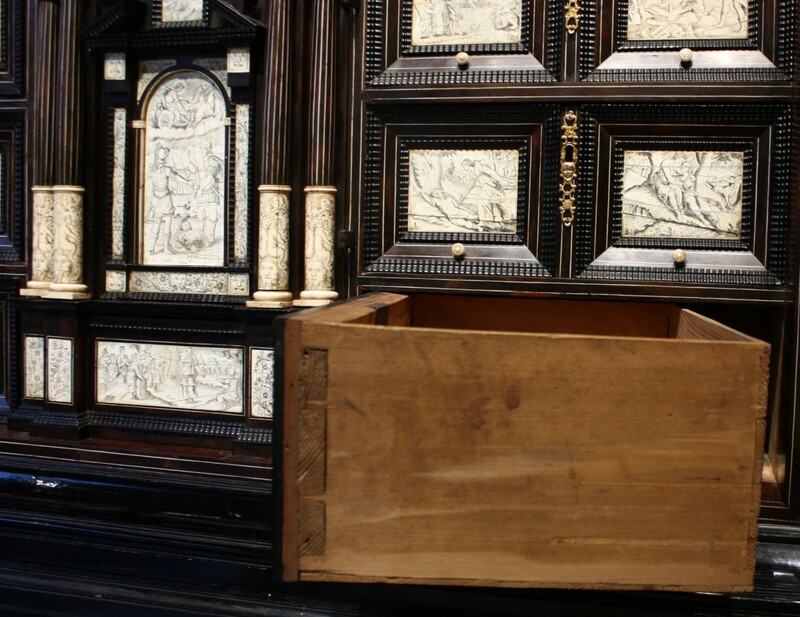 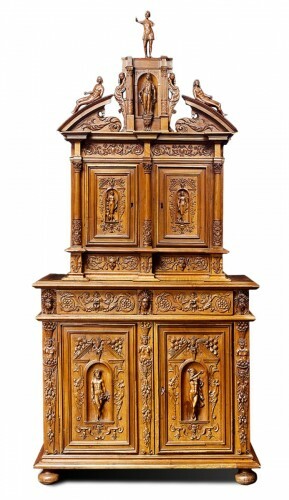 Our museum-quality cabinet is a rare example of the know-how and skill of artists from the early 17th century. 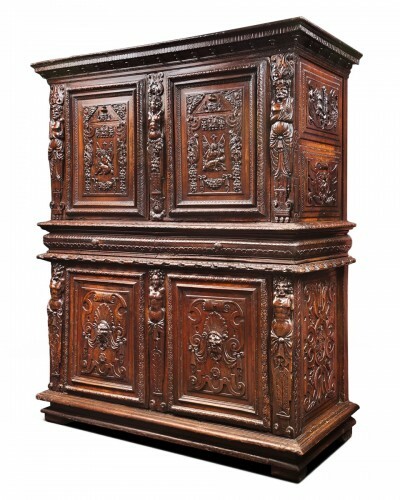 After annexing Portugal in 1580, Spain won the monopoly on the trade and importation of ivory and Ebony, the most luxurious materials used in the creation of furniture and objects. 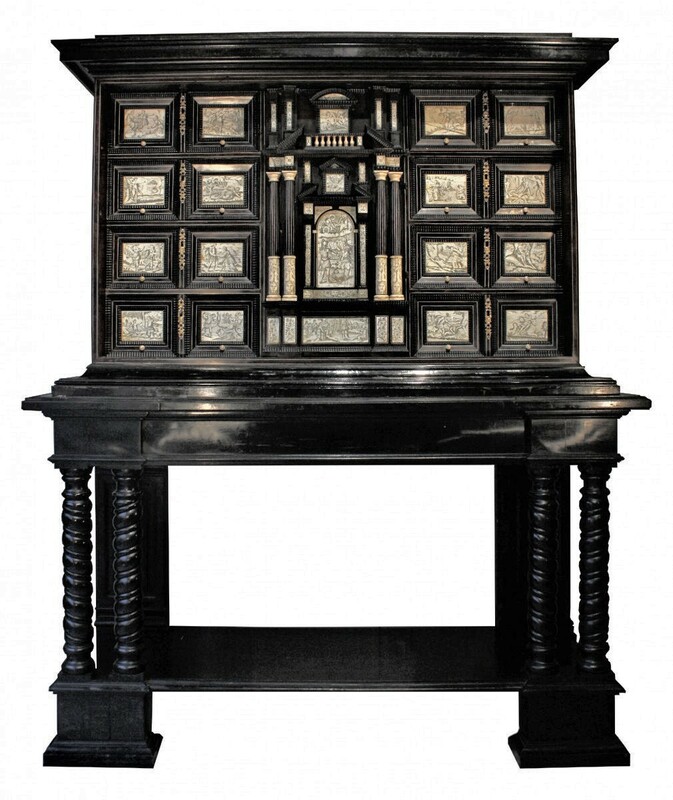 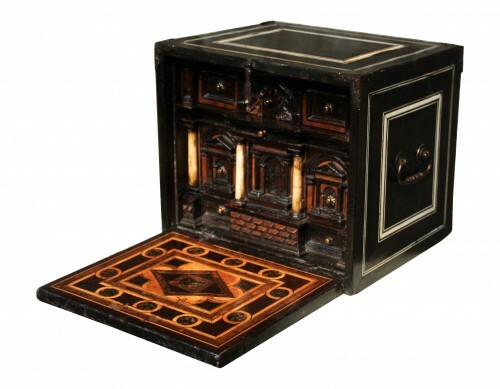 In the 1590s, the ebony veneer cabinets adorned with engraved ivory plaques enjoyed considerable popularity in Spain. 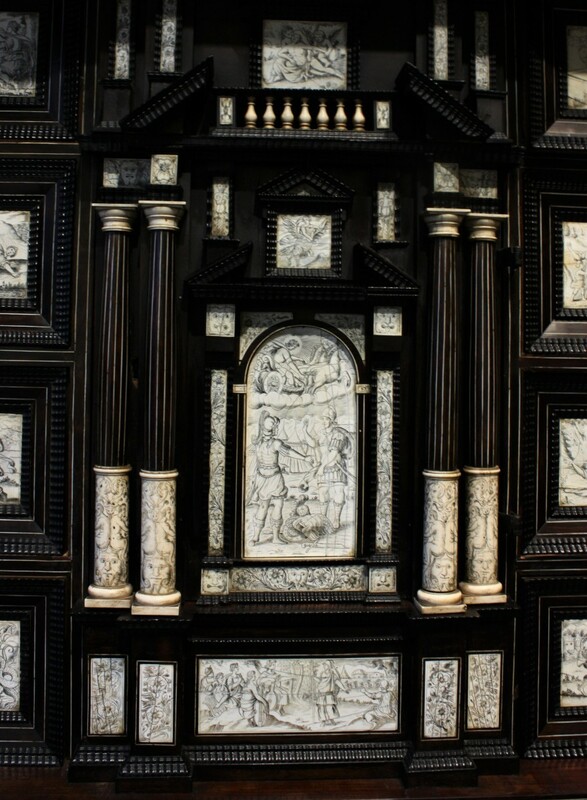 The best pieces were made in Naples, one of the most important Spanish territories, by cabinetmakers such as Iacobo Fiammengo. 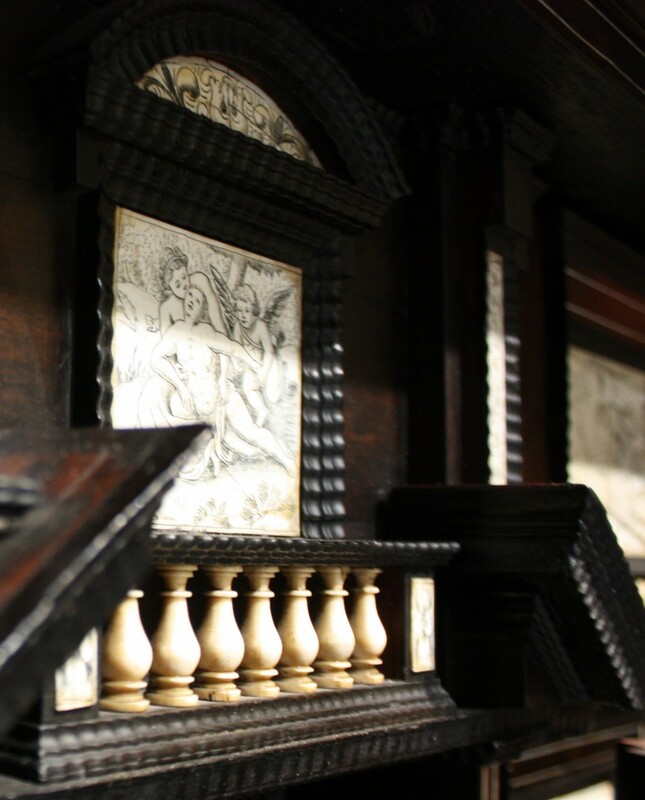 Iacobo Fiammengo signed collaboration contracts with several ivory engravers and hired Giovanni Battista de Curtis to work on two cabinets with scenes from the Old Testament and Ovid's Metamorphoses. Curtis ' signature appears on the cabinet at the Museum of Decorative Arts in Hamburg, the only piece of furniture with an attested origin. 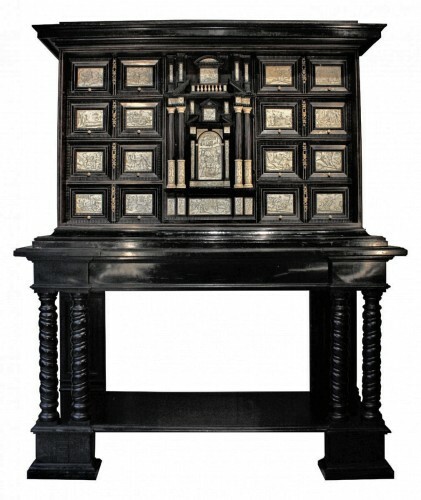 The firm originated in Spain, where it is known as Escritorio; In Naples, cabinetmakers such as Iacobo Fiammengo were called Scrittorista. 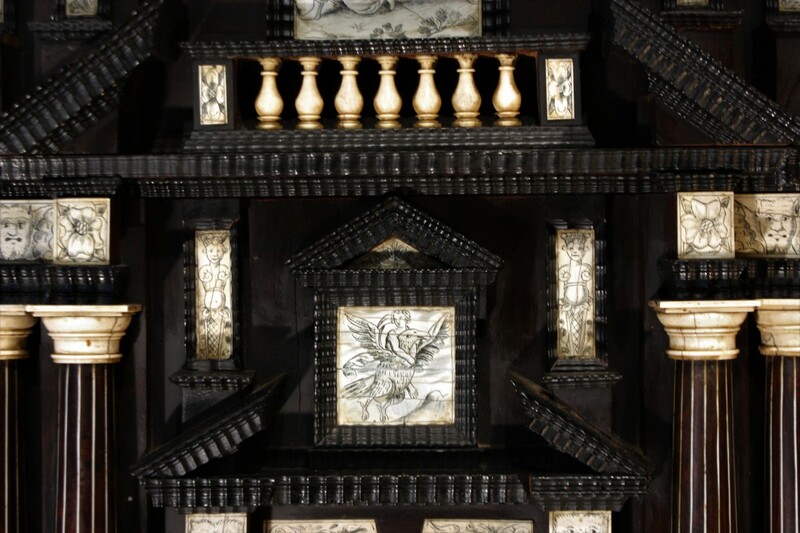 Mainly manufactured to accommodate the collections of curiosities and precious objects, the cabinets also had the role of demonstrating the wealth of their owners and thus the décor had to be as luxurious as possible, because destined for the Great nobility or to wealthy merchants or shipowners. 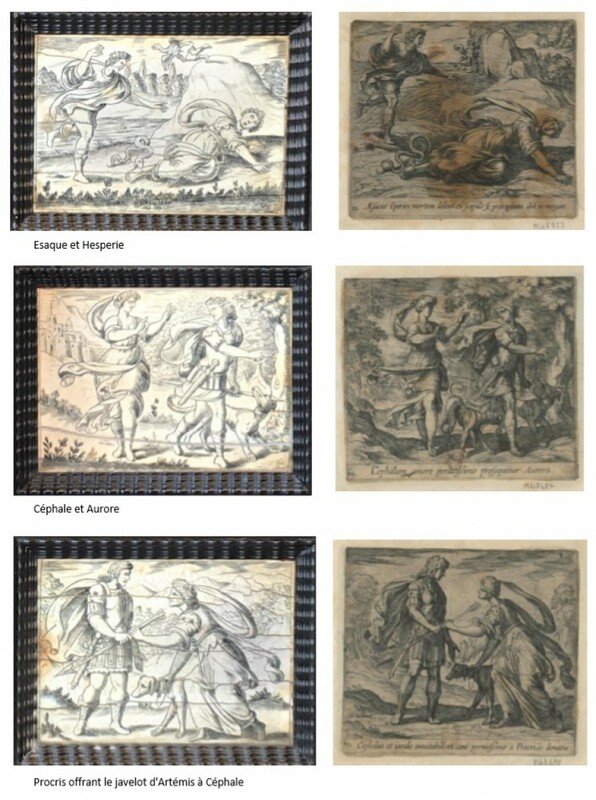 The Metamorphoses are epic poems written by the Latin poet Ovid in the 1st century A.D., in which he gathered about 250 myths and legends. This major work of Latin literature tells the mythical history of the world from the original chaos to the apotheosis of Julius Caesar. 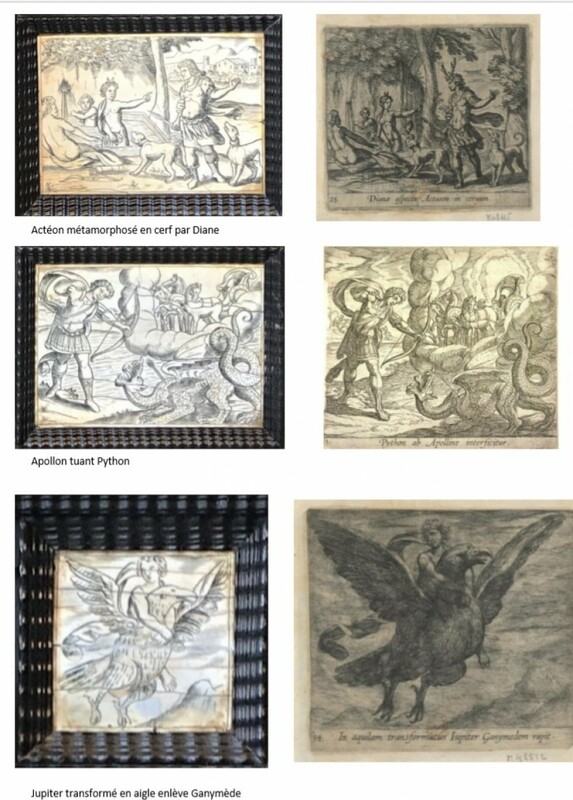 The Metamorphoses have been a great success and have inspired many artistic works throughout the centuries. 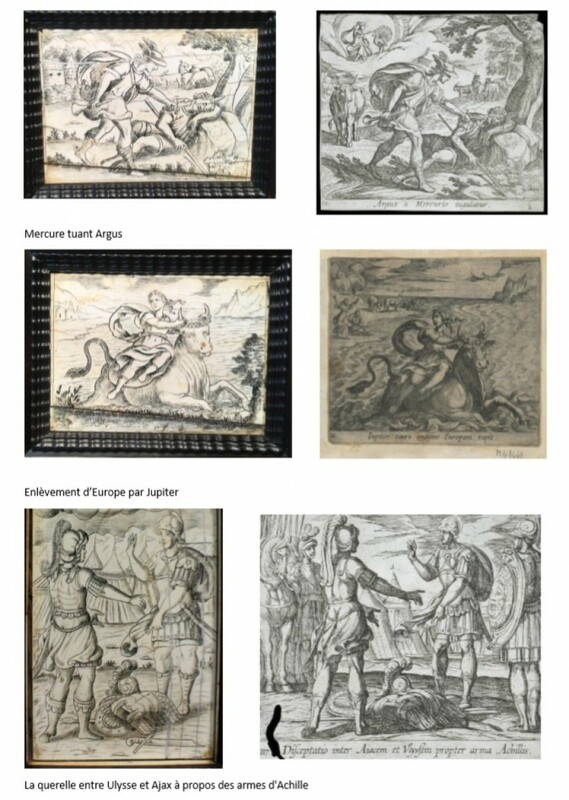 They tell stories of transformations of men, heroes or gods into animals or plants. 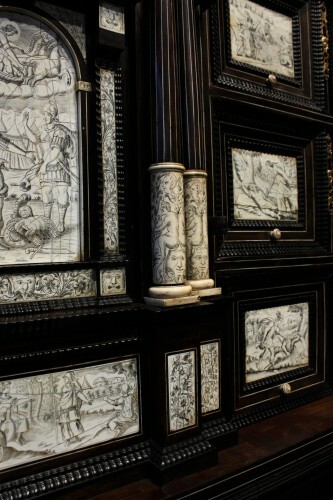 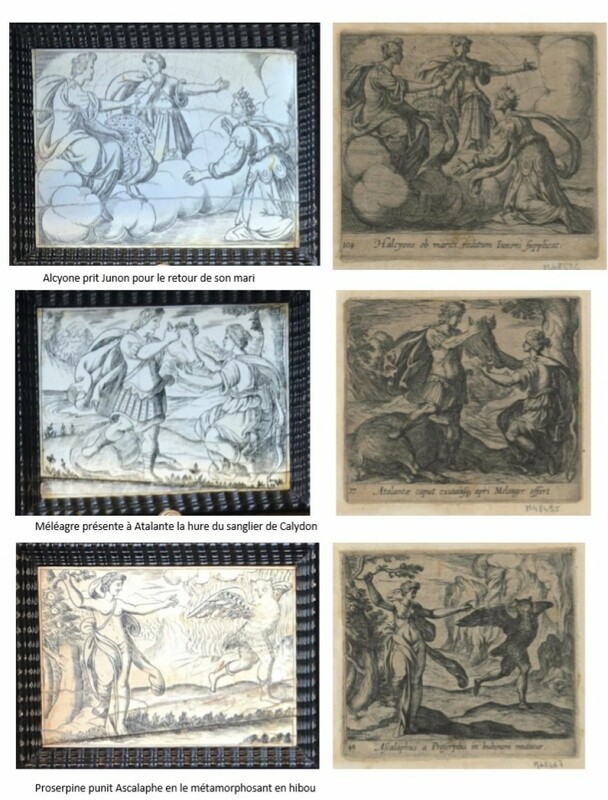 On our cabinet the engraved scenes come from the episodes relating the life of Europe and Jupiter, Mercury and Argus, Venus and Adonis, Meleager and Atalante, Proserpine and Owl and etc. 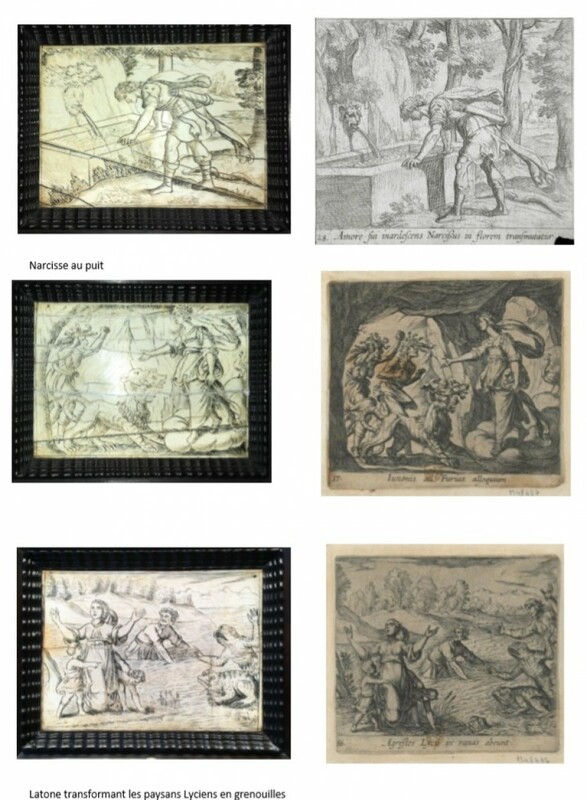 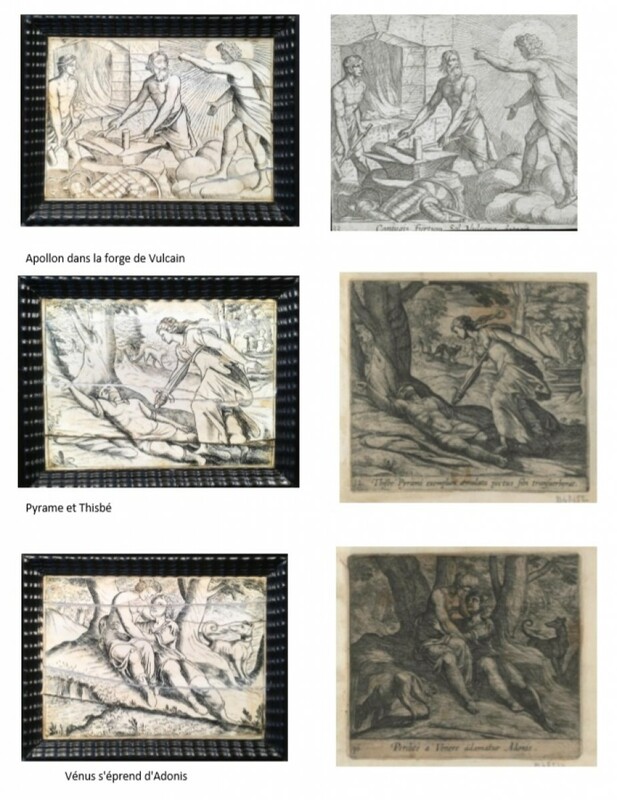 (see in the photos the scenes identified with the original engravings). Documentation: Alvar Gonzalez-Palacios, Il Tempio del Gusto.